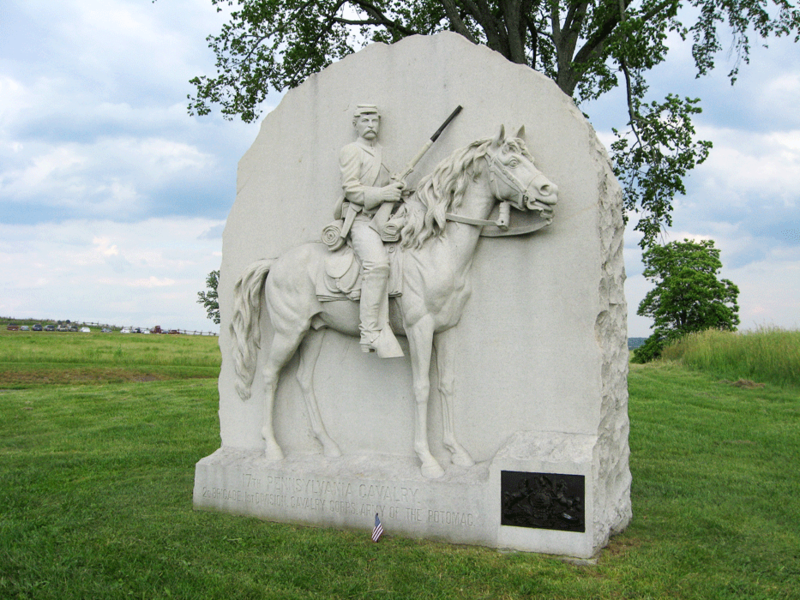 The 17th Pennsylvania Cavalry is unique because was actually in 3 different locations at Gettysburg – all at the same time. Why? 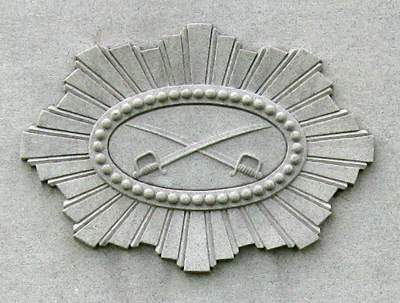 The V and XI Corps headquarters needed messengers. Here’s an overview of this regiment’s unique experience at Gettysburg. Compared to the 27th Indiana and 10th Virginia, the 17th Pennsylvania Cavalry was formed “late.” This regiment was mustered in the autumn of 1862 and was official enrolled in the United States Army on October 25, 1862. Drawing troopers from twelve separate counties across the state, these men came from varying backgrounds – farmers, workmen, tradesmen, small business owners. Some probably did not know how to ride a horse – a typical problem for Union cavalry regiments – but most in this regiment had some riding experience from their country lives or previous work. Months of drill and practice made this regiment ready for the battlefield. One thing I found particularly interesting is that some cavalry veterans from the Mexican War (1846-1848) enlisted with this unit. Just from their riding experience and “mentorship within the ranks”, this regiment would have advantage and opportunity on the battlefield. The Spring of 1863 was a decisive period for the Union cavalry. For the first time in Civil War history, they were successfully challenging the formerly superior Confederate horsemen. The 17th took part in the some of the important cavalry battles and skirmishes in this season. They were at Kelly’s Ford, Chancellorsville, Beverly Ford, Aldie, Upperville, Ashby’s Gap, and Middleburg, before arriving at Gettysburg. At Chancellorsville, the unit successfully held off part of Confederate General “Stonewall” Jackson’s flank attack, encouraging Union troops to rally. Union Cavalry, dismounted – this the way the 17th would have been fighting at Gettysburg. The 17th Pennsylvania Cavalry – commanded by Colonel Josiah Kellogg – was part of Devin’s brigade, Buford’s division. The march northward was long and difficult; the men and horses were exhausted. On June 29th a unique situation developed as the regiment passed through the town of Waynesboro, the hometown of the soldiers in Company G. They received permission to visit their families for the night, and it became a boasting point in the regiment that they all willing returned to duty the following morning. That day – June 30th – unexpected skirmishing to the west and a ride to Gettysburg would bring the regiment to one of the most important conflicts they would face. July 1st – the regiment was up before sunrise and spent the morning defending the ridges west of Gettysburg against overwhelming numbers of Confederates. As Union infantry came up later in the morning, the cavalry units were withdrawn. However, they would have one more important role on this day – they would help cover the infantry’s retreat to Cemetery Hill in the late afternoon. The 17th Pennsylvania Cavalry spent the night near Sherfy’s Peach Orchard, but got little rest, waiting to be called. The wagon train with the regiment’s rations finally arrived! 448 men of the 17th were present at Gettysburg, only 4 were wounded. The regiment was sent south to Maryland, to guard supply trains and did not play a significant role in the following days at Gettysburg. However, without their tenacious defense of Seminary Ridge at the beginning, the battle’s outcome may have been very different. Remember, these are the days before radios. Battlefield communication is challenging. Skilled horsemen carry written or verbal messages from the commanders to the units on the march or on the battlefield. Couriers were often selected by company and had a reputation for bravery. 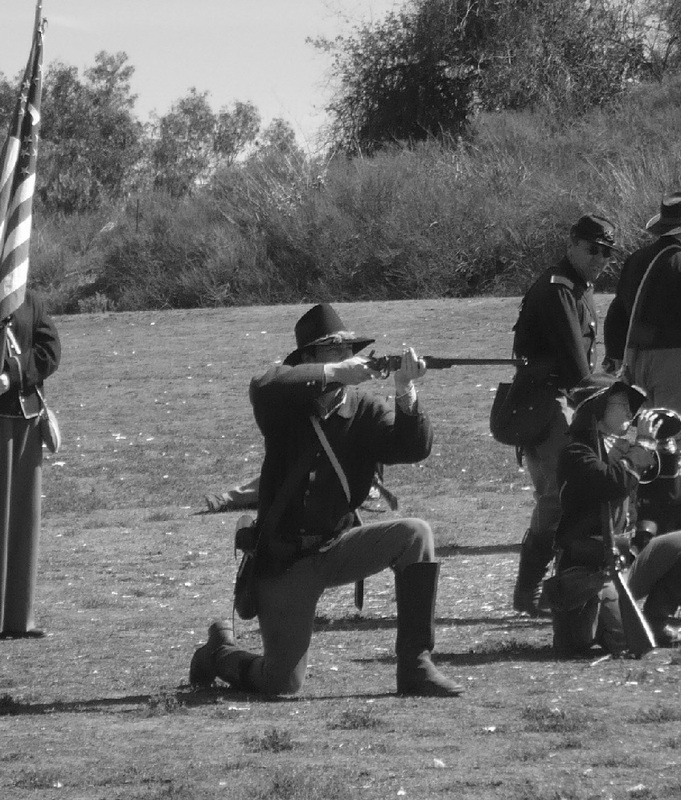 During a battle, they delivered messages under enemy fire – the opposing side knew they carried orders and would often try to shoot the messenger. Generals learned to send multiple couriers into the fray when there were important messages, hoping that one might get through. Companies D, H, and K of the 17th Pennsylvania Cavalry were not with the main part of the regiment, fighting on Seminary Ridge at Gettysburg. Rather, they were at headquarters as couriers. Commanded by Captain William Thompson, Companies D & H were messengers for the V Corps headquarters. The V Corps did not enter the battle until July 2, but the couriers would’ve been busy throughout the campaign carrying messages. Company K, led by Captain Richard Fitzgerald, provided couriers for XI Corps headquarters. The XI Corps was the second Union infantry corps to arrive at Gettysburg on July 1st, so these messengers would have been continually under fire through their Gettysburg experience. Rushing messages from headquarters to the battlefield, pleas for aid to other corps still on the march, and updates to the Army of the Potomac commander, these couriers had a busy and dangerous Gettysburg experience. The 17th isn’t exactly forgotten. Most Gettysburg books mention or detail General Buford’s fight on Seminary Ridge. The 17th was there, so their “battle area” gets attention in history studies, but they don’t often get a lot of recognition. They didn’t fire the first shots at the Confederates, they were just a steady regiment fighting with all the others. But, if Buford hadn’t had good, sturdy regiments, what might have happened? Couriers tend to be forgotten in studies of the Civil War. We forget how the commanders sent and received messages. But if the messengers from the 17th hadn’t got through, what might have happened? At Gettysburg, every regiment, every man played an important part. While we’ll probably always have our favorite units, don’t forget the importance of all the regiments. One regiment did not single handedly win Gettysburg. And one regiment – the 17th Pennsylvania Cavalry – was in 3 separate locations, fighting or riding for victory. P.S. Your thoughts on this unique cavalry regiment at Gettysburg? If you want more in-depth information about the unit, visit this post on Mr. Petruzzi’s blog. He’s an outstanding historian of Civil War cavalry. Thank you for the link back to my blog (I haven’t posted on it in a long time but I still keep it active for the information). You’re doing great work and congratulations on your dedication to history! Thank you for your kind words. I have enjoyed the in-depth articles on your blog. Cavalry is one of my favorite topics in Civil War studies, and I hope to explore it more in the future.